Welded steel NRS Oar Clip clamps to the oar shaft quickly and securely with two steel hose clamps . Compatible with our NRS Thole Pins, the NRS Oar Clip fits Carlisle, Cataract and other similar sized oars (1 7/8") oars. Comes with two clamps. 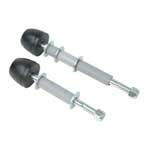 NRS Thole Pin 9" or 12"